Get to work! You’re 27 already (or getting close)… & and silly hats. John Calvin has been dead for 450 years but there is little that we talk about at ThirdPlace (or church on Sunday or at Bible Studies) that Calvin’s influence hasn’t shaped. You don’t have to of read Calvin’s epic “Institutes”, to have been influenced by it, but if you pick up a copy you’ll quickly notice that most of the doctrine that we teach and understand has roots reaching back to Calvin’s work. Funny thing about it was he wrote it when he was just 27 years old! 1. From an early age, Calvin was a precocious student who excelled at Latin and philosophy. He was prepared to go to study of theology in Paris, when his father decided he should become a lawyer. Calvin spend half a decade at the University of Orleans studying law, a subject he did not love. 5. During his ministry in Geneva, Calvin preached over two thousand sermons. He preached twice on Sunday and almost every weekday. His sermons lasted more than an hour and he did not use notes. 6. Around 1553, Calvin began an epistolary relationship with Michael Servetus, a Spanish theologian and physician. Servetus wrote several works with anti-trinitarian views so Calvin sent him a copy of his Institutes as a reply. Servetus promptly returned it, thoroughly annotated with critical observations. 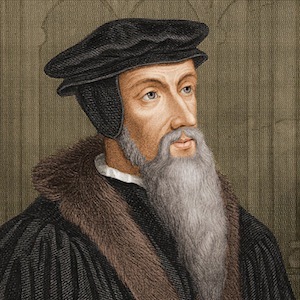 Calvin wrote to Servetus, “I neither hate you nor despise you; nor do I wish to persecute you; but I would be as hard as iron when I behold you insulting sound doctrine with so great audacity.” In time their correspondence grew more heated until Calvin ended it. 7. In the 1500s, denying the Trinity was a blasphemy that was considered worthy of death throughout Europe. Because he had written books denying the Trinity and denouncing paedobaptism, Servetus was condemned to death by the French Catholic Inquisition. Servetus escaped from prison in Vienne and fled to Italy, but stopped on the way in Geneva. After he attended a sermon by Calvin, Servetus was arrested by the city authorities. French Inquisitors asked that he be extradited to them for execution, but the officials in Geneva refused and brought him before their own heresy trial. Although Calvin believed Servetus deserving of death on account of what he termed as his “execrable blasphemies”, he wanted the Spaniard to be executed by decapitation as a traitor rather than by fire as a heretic. The Geneva council refused his request and burned Servetus at the stake with what was believed to be the last copy of his book chained to his leg. 8. Within Geneva, Calvin’s main concern was the creation of a collège, an institute for the education of children. Although the school was a single institution, it was divided into two parts: a grammar school called the collège and an advanced school called the académie. Within five years there were 1,200 students in the grammar school and 300 in the advanced school. The collège eventually became the Collège Calvin, one of the college preparatory schools of Geneva, while the académie became the University of Geneva.